Slump in crude oil prices prompted the government of Saudi Arabia to slash its budget for 2016. This has further resulted in decline in government spending and delayed payment to contractors leading to halt of several projects across the region. Deployment of industrial pumps has been low and was primarily noticeable across industrial settlements which were establish during the past in addition to petrochemical and oil & gas applications. According to 6Wresearch, Saudi Arabia Industrial Pumps market size is projected to grow at a CAGR of 2.4% during 2017-23. Following the decline in 2015 & 2016, similar trend is expected in 2017 as well. However, the market is anticipated to recover post 2017 due to expected recovery of oil prices, rebound of construction industry, exponential growth across industrial sector and establishment of petrochemical industries, which would drive Saudi Arabia Industrial pumps market forecast period revenues. Amongst all applications, oil & gas and chemical primarily Petrochemical and Fertilizers (PCF) led Saudi Arabia industrial pumps market share. Significant growth lies ahead for chemical, power and water and wastewater treatment applications. The key players in Saudi Arabia industrial pumps market include: Flowserve-Al Rushaid Company Ltd., ITT Saudi Co., Sulzer Saudi Pump Company LLC, KSB Pumps Arabia Ltd., EBARA PUMPS SAUDI ARABIA LLC, Grundfos Saudi Arabia Company Ltd. and SPX Flow Saudi Arabia LLC. The Saudi Arabia industrial pumps market report thoroughly covers the market by types, applications, and regions. 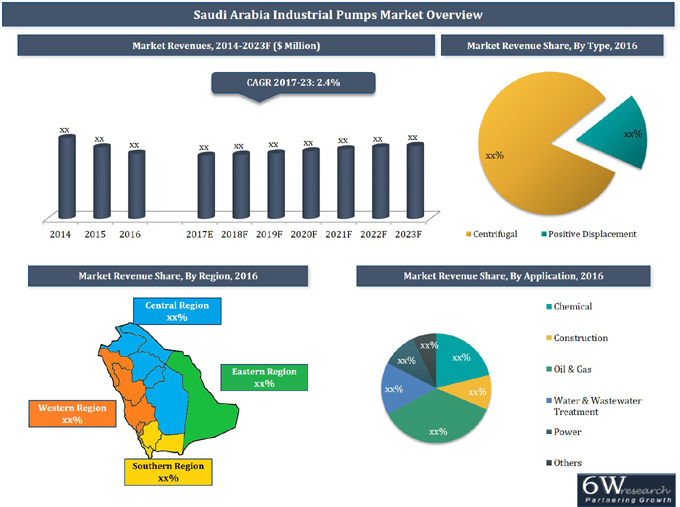 The Saudi Arabia industrial pumps market outlook report provides an unbiased and detailed analysis of the on-going Saudi Arabia industrial pumps market trends, opportunities/ high growth areas, market drivers which would help the stakeholders to device and align their market strategies according to the current and future market dynamics. 13.2 KSB Pumps Arabia Ltd.
13.3 Flowserve-Al Rushaid Company Ltd.
13.5 Grundfos Saudi Arabia Company Ltd.